Margaret K. McElderry Books, 9781481476966, 544pp. Charlotte and Emily Brontë enter a fantasy world that they invented in order to rescue their siblings in this “lovely, fanciful” (Booklist, starred review) novel from the New York Times bestselling author of The Girl Who Circumnavigated Fairyland in a Ship of Her Own Making. Inside a small Yorkshire parsonage, Charlotte, Branwell, Emily, and Anne Brontë have invented a game called Glass Town, where their toy soldiers fight Napoleon and no one dies. This make-believe land helps the four escape from a harsh reality: Charlotte and Emily are being sent away to a dangerous boarding school. But then something incredible happens: a train whisks them all away to a real Glass Town, and the children trade the moors for a wonderland all their own. This is their Glass Town…almost. Their Napoleon never rode into battle on a fire-breathing porcelain rooster. And the soldiers can die; wars are fought over a potion that raises the dead, a potion Anne would very much like to bring back to England. But returning is out of the question—Charlotte will never go back to that horrible school. Together the Brontë siblings must battle their own imaginations in this magical celebration of authorship, creativity, and classic literature from award-winning author Catherynne M. Valente. * "A throwback to classic children’s literature: it has the cleverness of The Phantom Tollbooth, the imagination of Alice in Wonderland, the whimsy of Edward Eager...A lovely, fanciful piece of middle-grade fiction about the worlds we make, and the lives they can take on." * "The story’s real delights come from the wit and cleverness woven into every description and conversation, as well as the sharp insights Valente brings to the children’s insecurities, longings, and hidden desires, which burst to the surface in this magical and perilous world." * "In a middle-grade fantasy reminiscent of beloved tales from Edward Eager and Pamela Dean, the imaginary realms of the Brontë juvenilia come to wondrous life...An absolute must for fans, of course; but even readers who've never heard of Heathcliff will be captivated from the first page to the last." 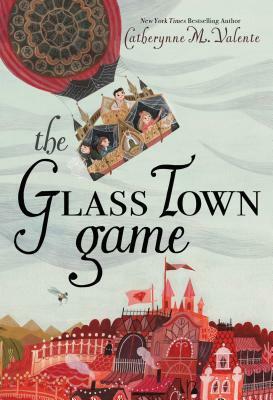 "The wildly imaginative Brontë siblings might have invented Glass Town, an imaginary land of romance, intrigue, and splendid battles, but they have met their creative match as Valente brings it to vibrant fictional life in this novel." "Valente’s fantasy is...driven by energetic wordplay and wacky invention that keep it bounding along."